Construction fencing and stormwater protection measures are installed before cleanup begins. Equipment is used to replace contaminated soil with new soil. What do most people picture when they think of a toxic cleanup site? Maybe an old rundown factory or rusted metal drums. Not someone's yard. This work is part of Ecology's Residential Yard Sampling and Cleanup Program. The program cleans up arsenic and lead from the former Asarco copper smelter in Tacoma. On each site, we bring equipment to the yard and put up orange construction fencing (see photo right). Then we dig out the top 12 to 18 inches of soil and replace it with new soil. Last, we restore the landscaping and maintain the new lawn for 60 days. 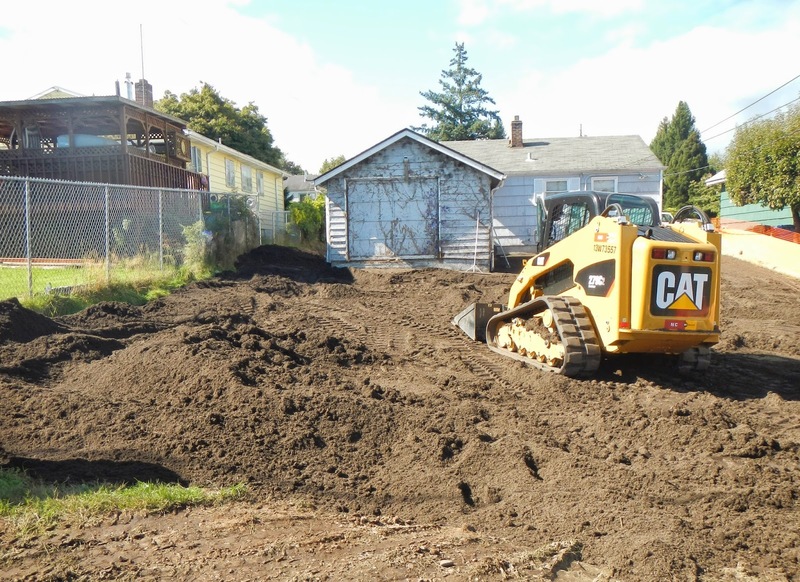 Fact sheet for soil cleanup in Tacoma in 2014. Ecology's website: Check out the Yard Cleanup updates page for updates on completed work. Sign up for email updates on our listserv. Questions about the yard cleanup work? or email me at Jill.Jacobson@ecy.wa.gov.